A long time ago, in a galaxy far, far away, there appeared the Galaxy Note 7. Ok, so we made up the first part of that sentence, but the Galaxy Note 7 is here, in our time and galaxy, and it’s packed full of cool features. We’re talking about iris-scanning technology that supposedly makes the device more secure, high-dynamic range video better than anything you’ve seen before, and a stylus that lets you write on your phone underwater, because, well, who wouldn’t want to be able to do that? Sounds pretty cool, but how useful and applicable are these upgrades? And what’s the verdict on the Galaxy Note 7 versus the iPhone 6s Plus, Apple’s most recent star player? Here’s the specs and features review of the Galaxy Note 7. The Galaxy Note series has been an integral part of Samsung’s smartphone arsenal since 2011. And they have not disappointed. The latest Note skips a generation and becomes 7, conveniently aligning it with the current S7 series. 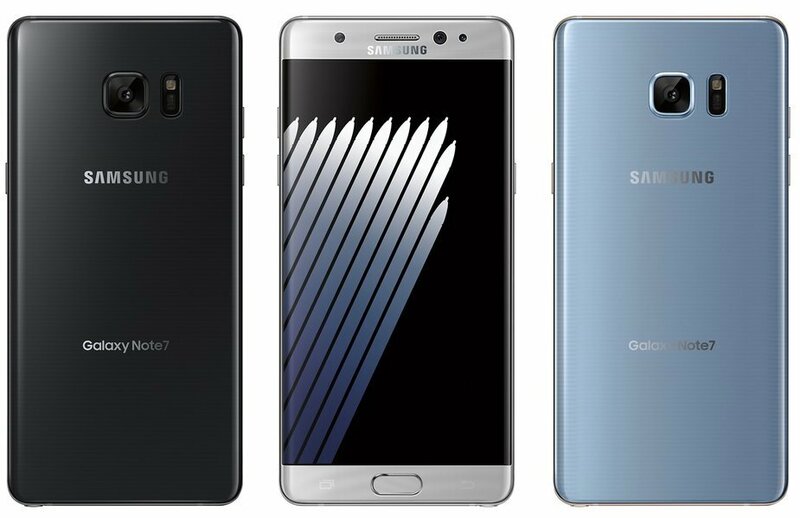 Looks wise, the Note 7 is a slightly larger version of the S7 Edge, with its front and back curved glass panels joined by a slick metal frame. The curves of the Note 7, however, are more refined than the S7 Edge, lessening the likelihood you’ll touch the display while holding onto the handset. The USB port is out, as Samsung has finally utilised the faster and more convenient Type-C version. The rest of the design is in line with the look and feel of its predecessor. The Note 7 is a tad smaller in dimensions and slightly lighter in weight than the Note 5, but that doesn’t stop it from looking like one of the best looking whistle-worthy smartphones on the market. For the first time, Samsung has used a dual-curved edge display on a Note smartphone. The Note 7 has a 5.7-inch Super AMOLED panel with a 2560×1440 resolution and 518ppi protected by Gorilla Glass 5. The Note 7 borrows the 12MP camera that featured on the S7 and the S7 Edge. You get an f/1.7 aperture with OIS along with dual-pixel auto-focus technology and sharp 4K video recording capability. The front camera with the wide 22mm lens remains the same as the Note 5. For the techies among us, here’s the Note 7’s tech specs. The Note 7 runs on the same Exynos 8890 octa-core processor from the S7 series along with 4GB of RAM and a Mali-T880 MP12 GPU. The octa-core processor comes with four Mongoose cores clocked at 2.3 GHz and four Cortex-A53 cores clocked at 1.6 GHz. It has a 64GB of fixed storage and a microSD card expansion option which supports up to 256GB microSD cards. Connectivity options include LTE, dual-SIM card option (hybrid slot), Wi-Fi, Bluetooth, USB Type-C, GPS. The battery has been upgraded to last (according Samsung) a full day, which you can significantly extend by using the battery saver mode to restrict CPU activity and dim screen resolution. While the Note 7 still has the fingerprint scanner we’ve come to expect from any modern flagship, it now offers an alternative method of unlocking your phone and accessing websites, without having to enter a password or scanning your digits. All you have to do is hold the phone about 20-30cm away from your face, line it up with your eyes, and access is granted. There’s a small sensor above the display that, once set up, will read your eyes and unlock the phone. Pretty cool. The Note 7 comes with an official IP68 certification, making it the first waterproof (actually tested and certified) smartphone of the Note series. The refined thinner-tip S-Pen also complies with the IP68 certification, and you can use the S-Pen to write on the Note 7 screen in the rain or even underwater. So whether you’re swimming, surfing, paddling, or part of a Titanic re-enactment, you’re safe to use the Note 7 above or beneath the waves. The new and improved Note 7 is gorgeous to look at and shows off all the right features. We particularly like its powerful OS, large high-res screen, and the fact that this phone, unlike others which claim to be, is actually certified waterproof. On the downside, the battery is smaller than the S7 Edge and the iris scanning capability is more for show than necessity. Samsung’s Galaxy Note 7 hits shelves in the US on 19 August. For more new gadget reviews, check out the Repair Express blog. We’ll tell you what’s hot and what’s not, and keep you up to date on all the latest and greatest in the tech world. As for all of your mobile device repairs, we can fix anything guaranteed. And don’t just take our word for it either, check out our industry leading lifetime warranty.